Team Futaba WOW'S at Nats! 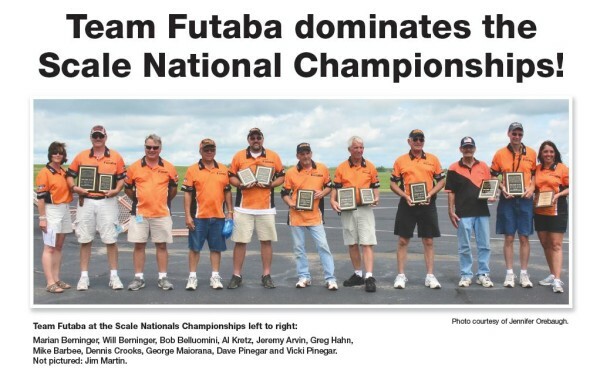 Home » Industry News » Team Futaba WOW’S at Nats! Team Futaba WOW’S at Nats! To say that Team Futaba did well at the 88th annual Scale National Aeromodeling Championships may be the understatement of the year! No fewer than three team members left the Nats as the National Champion in their classes. Mike Barbee repeated in Expert class with his incredible T-34B, Will Berninger won Open with his T-34C and the duo of George Maiorana and Dave Pinegar took Team Scale class with George’s C-133. However, honors for Team Futaba didn’t stop there. Greg Hahn finished second in Expert, Al Kretz and Jeremy Arvin took second in Team Scale and Dennis Crooks, Will Berninger and Mike Barbee flew to second, third and fourth place finishes respectively in Fun Scale. Skill and talent aren’t the only things these accomplished pilots/builders have in common: they also put their trust in the quality, performance and dependability of Futaba equipment. Hobbico and Futaba congratulate Team Futaba on another incredible performance at the Nationals!